My husband and I have been experimenting with more vegetarian recipes. I realized that almost all of my vegetarian recipes involved cheese or pasta and I needed to branch out. 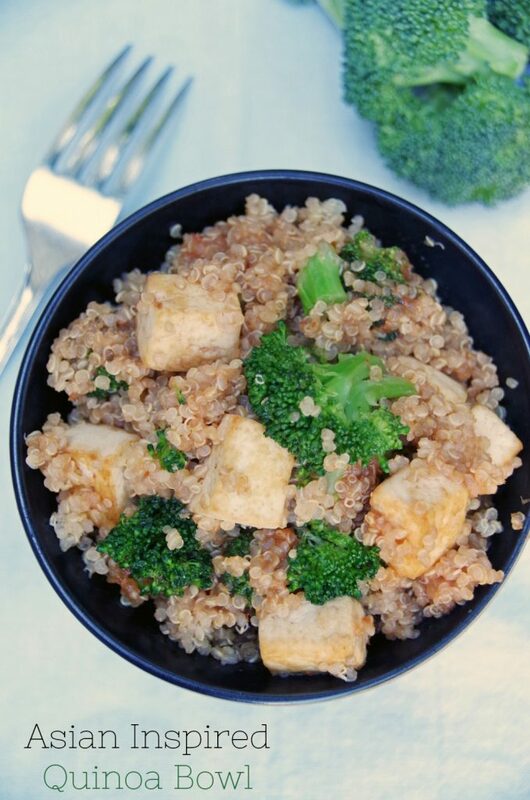 This Asian quinoa recipe is loaded with protein from both the tofu and the quinoa. Fresh broccoli gives it a boost of color and the Asian inspired sauce provides a nice, bold flavor. It was honestly very tasty and I am not a huge tofu fan. This recipe served 4 people easily and I will definitely be making it again. 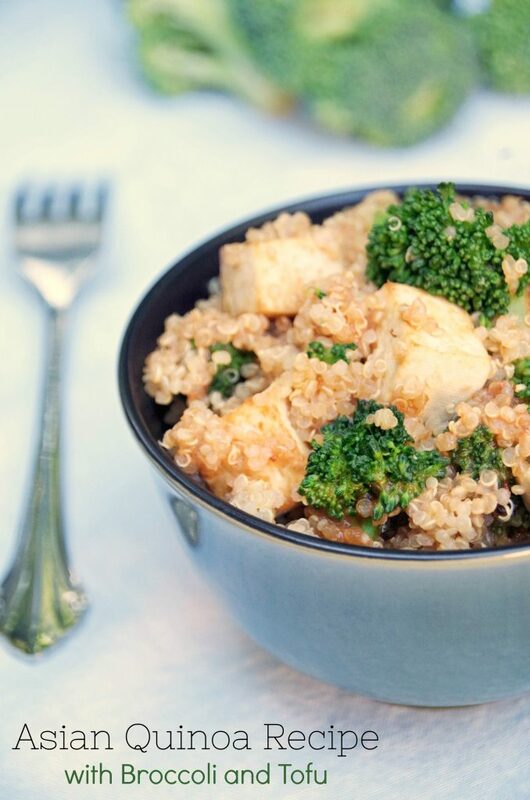 A few notes about this Asian inspired quinoa recipe before you make it. Quinoa comes in lots of different colors. Personally, I prefer the white quinoa but you could probably make it with just about any variety. For the tofu, get a firm tofu for this recipe. You want relatively firm chunks and you will be sauteing it for about 10 to 15 minutes to get it lightly browned on all sides. Personally, I choose organic tofu whenever possible. Soy is one of those things that I just prefer to buy organic. Other than those two notes, this quinoa recipe is very easy to make and took us about 30 minutes from start to finish! It’s a great Meatless Monday recipe to add to your repertoire! Cooking with quinoa definitely makes vegetarian recipes easy and delicious! Recipe adapted from The High Protein Vegetarian Cookbook. If you are trying to find good sources of protein that are not animal based, quinoa is a great choice. It also cooks faster than rice, which is nice when you are in a hurry! In a pot, cook the quinoa in the water according to package directions. While it cooks, heat olive oil in a large frying pan. Add the white parts of the green onions and saute 1 to 2 minutes. Add in the tofu. Cook for 10 to 15 minutes, stirring regularly, until golden on all sides. In a small bow, combine sauce ingredients (peanut butter, tomato paste, vinegar, siracha, soy sauce, honey, and ginger). Whisk til combined. When tofu is golden, add in the fresh broccoli and saute 3 to 4 minutes. You want it slightly firm but not hard. Add in the quinoa and sauce and mix well. Top with green parts of onion and enjoy! Like this quinoa recipe? Pin for later! It really was delicious. We have found a ton of meatless dishes that we enjoy!